How many times have you gone to the store and discovered that prices on some items are expensive? This happens to all of us but some individuals think they can get a “five finger discount” on products by putting them in their purses or pockets. Retail thefts cause prices of other products to necessarily go up as well. Individuals who commit retail theft are sometimes part of a crime ring to buy and sell stolen property. These individuals are called “boosters” and they sell their stolen property to “fences” who sell the property to the public. The fences can be pawnshops, junk yards, second-hand stores, etc. Recently in South Florida a large group of individuals were arrested for committing many retail thefts and selling the stolen property to fences who sold the property to other fences. The overall estimated worth of the stolen property was at 15 million dollars from stores such as CVS, Public, and Walgreens. The fences sell to other fences and make the products more legitimate and harder for law enforcement to detect. Sometimes, however, people are not thieves but are mistakenly charged with retail theft. This happens when a store employee is accused of stealing some store inventory because the inventory looks like it is stolen. Inventory can appear stolen because of poor record keeping. Sometimes another employee is trying to “set-up” the victim co-worker to take the blame for a potential error they made or for their theft. Shoplifting, also called retail theft, is charged under this statute. If you or someone you know has been charged and arrested in accordance to this statute, do not hesitate to contact one of our West Palm Beach criminal lawyers. Another odd way people might violate this statute is that they take a shopping cart off the merchant’s premises. Many times we have seen shopping carts around the neighborhood near stores with some teenagers even destroying them. (2) You intended to deprive the merchant of possession, use, benefit, or full retail value of the merchandise or shopping cart. Individuals have all sorts of creative ways they use to try and steal property. Individuals wrap aluminum foil around the alarm sensors so as to prevent them from signaling the store’s alarm. Sometimes they create “booster bags” which are purses that are lined with thick material to prevent the sensors from triggering the alarms. Florida Statute 812.015(7) prohibits anyone from possessing an anti-shoplifting countermeasure device. What the State Prosecutor Has to Prove to Convict You of Possessing an Anti-Shoplifting Countermeasure. (3) Within any premises used for the retail purchase or sale of any merchandise. Florida Statute 812.015(1)(i) says , “‘Antishoplifting or inventory control device countermeasure’ means any item or device which is designed, manufactured, modified, or altered to defeat any antishoplifting or inventory control device.” The Fourth District Court of Appeal held that tin foil wrapped around a sensor did not violate this statute because tin foil in and of itself is not an item or device which is designed, modified, or altered to counter anti-shoplifting sensors while a booster bag that was heavily modified and altered to have tin foil lining was a violation of this statute. See Cenatis v. State. If you shoplifted $300 or more and you coordinated with others, you stole from other places within a 48 hours period, you worked with others to cause a diversion, or you bought a box that really has something else hidden inside it, you commit a third-degree felony which is punishable up to 5 years in prison and a $5,000 fine. If a law enforcement officer, merchant, or merchant’s employee tried to stop you and you resisted, that is a first-degree misdemeanor. You can be prosecuted for resisting and shoplifting at the same time. If this is your second time committing retail theft, you can be given a fine between $50-$1,000 or receive community service hours. Possessing anti-shoplifting countermeasures is a third-degree felony punishable up to 5 years in prison and a $5,000 fine. 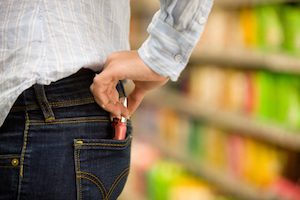 Cases involving shoplifting involve many facts. Call our office today to schedule an appointment for a free consultation with one of our lawyers. We want to find out as much as you know so we can put together a defense for your case. We will take depositions of the individuals involved to find out if anyone else saw anything. We will fight your case all the way to trial; however, sometimes cases just cannot be won. In this situation, our West Palm Beach crime attorneys will still keep on defending you by trying to convince the prosecutor and judge to change the charges or reduce the sentence. Whatever the situation is, our attorneys will be fighting to get you the best results!